A good choice for a bad site. 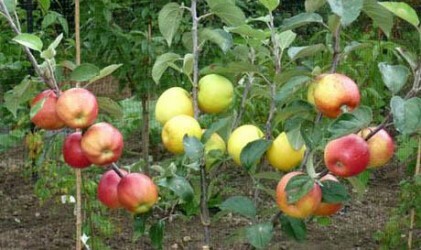 A hardy variety which crops well and regularly. 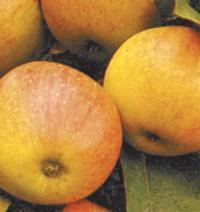 It is a medium sized dessert apple, yellow in appearance with speckles and stripes and an orange skin. 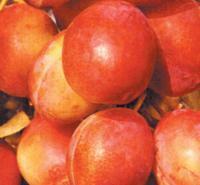 Available on M9 rootstocks. 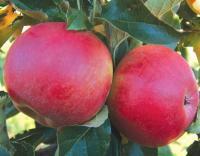 This variety is a triploid and produces best when cross pollinated with two other varieties. Red on a yellow green background, an excellent balance of sharpness and sweetness. Large fruit. Harvest time late September/mid October. 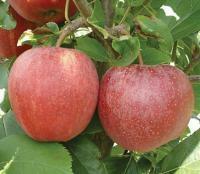 A variety which produces fairly large fruit with nice bright red blushing on yellow background. It has an excellent taste with milk white flesh. Harvesting time mid-October. Self-fertile. Very good pollinator for other varieties. A self-fertile tree which produces dark red fruit with white flesh. This is a very fertile good universal pollinator, with a long flowering period and good pollen. It is also used as an overall pollinator with 6%-10% spread amongst the main varieties. Excellent taste, dark red in colour with aromatic white flesh. Very early mid August to mid September. Good pollen, self fertile, very productive. Best early variety. By far the most popular cooking apple. 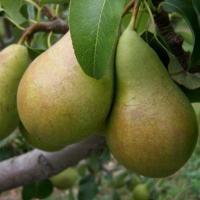 It produces heavy crops of extra large fruit with creamy flesh which is juicy and full of flavour. This variety is a triploid which requires pollination partners. Harvesting time mid-October. 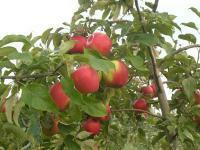 A delicious top quality dessert apple, strong, with good display and shelf life. Firm, crisp and very juicy flesh with a pleasantly fresh and fine taste. Numerous prizes have been won worldwide for taste, storage and its bright red colour. This variety is a triploid and needs two other varieties to pollinate it. A Red Elswout/Elstar cross. 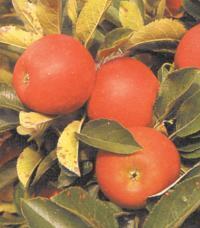 Medium to large fruit with a deep red solid flush. Two weeks earlier than Elstar and similar in terms of taste. Can be harvested in two pickings. It is more or less self-fertile. 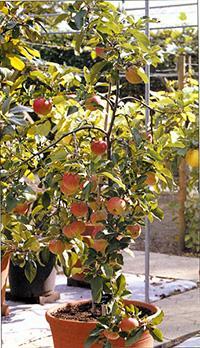 Malus Evereste crabapple trees are compact, upright plants with an excellent flush of white flowers in late spring. It’s naturally tidy canopy makes it perfect for a small garden. 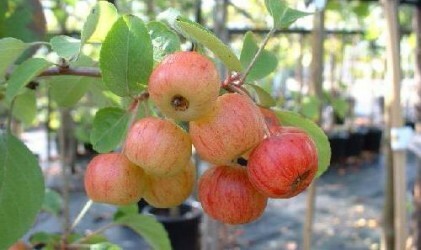 Malus Evereste can reach a height of about 6-7 metres. 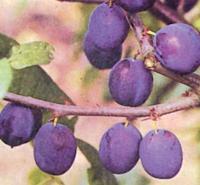 Victoria Most popular of all plums because it is self-fertile and also a reliable heavy cropper. Flesh is yellow-green and flavour is good. If you are only growing one tree, this is the one. A blue/black skinned damson, with a juicy yellow flesh. Very popular variety. 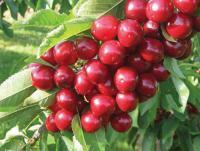 This is a self fertile variety which bears dark red fruit and has an excellent flavour. Harvesting time late July. An excellent new variety with higher yields than most. Flavour and texture are also highly recommended. Harvesting time late October. Conference is the number 1 choice because it is very reliable in this country and is self-fertile. 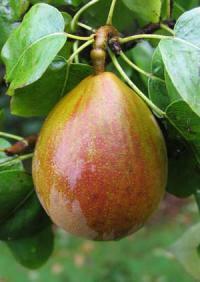 The fruits are long, narrow and juicy with firm flesh and good flavour when ripe. 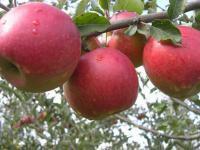 Start harvesting in late September.